All those, who regularly visit various caravanning fairs, certainly saw (for example at the stands of "Polish Caravaning” magazine) the prototype of the world's first camper-cabrio based on a truck, Mercedes Atego. During the CMT 2019 in Stuttgart, the production version of this vehicle will be premiered. Its designer and originator is a Pole, Piotr Kubiński, who has lived in Germany for over 20 years. The prototype based on the used Mercedes Atego 815 truck was shown at over a dozen different caravanning fairs, mainly in Germany and Poland. Visitors crowded in on the vehicle, talked to its designer, asked about the future of the project. 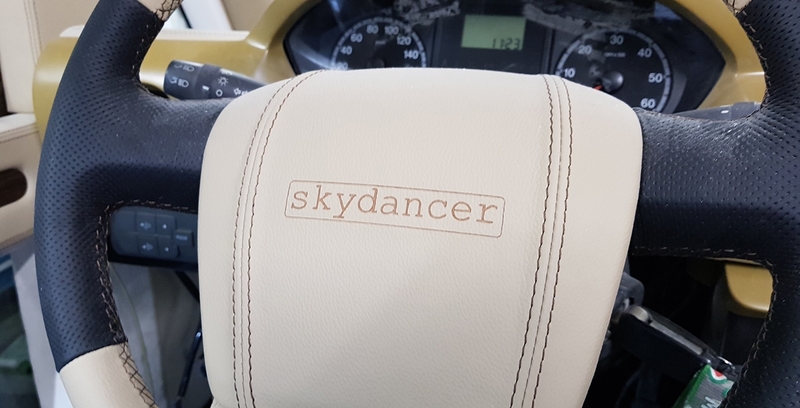 The man responsible for the Skydancer (because that's what the cabrio camper will be called) is Piotr Kubiński, a Pole who has lived in Cologne for years. Interestingly, the car in the production version, whose premiere is planned for the CMT trade fair in Stuttgart, is being created in the Polish company Balcamp specializing in individual camping buildings. The prototype, that could be seen at the fair, is Piotr's original vision. The base is a 7.5-ton truck, which has been reworked with its own craftsmanship. In this way I wanted to show the concept of a camper cabriolet - a novelty that does not exist in the world yet. I can officially state that my prototype is the world's first convertible cabrio - he told about the project during the Motor Show fair in Poznan. The conversation could not be carried out smoothly, new guests were still appearing at the stand. The prototype conquered the market not only in Poland but also abroad. The German and British media paid attention to a completely new idea. Skydancer's plans go further - currently, on the official website of the project, American investors are sought. It's a good step, Americans love both cabriolets and motorhomes. The prototype, the furniture in it - it all has its own climate, but most of them are used things, which I used due to the reduction of costs. It's just an idea, it could not be shown to customers in this state. When I was building it, I wanted to show this concept, a camper on two levels: the residential part below, the cabin higher - explains Kubiński. - The first idea was a panoramic camper, with high visibility, driver surrounded by windows. Later, the whole evolved. The CMT trade fair in Stuttgart starts on January 12, 2019. This is the first time the world will see the production version of Skydancer. What do we know? The vehicle base will be Citroen Jumper. The roof opening mechanism will remain the same, as will the entire vehicle body. It will still be a two-storey camper, i.e. with a living area downstairs and a driving cab at the top. In the middle you will find the full, standard equipment of a motor home: fridge, heating, bedroom, kitchen, stove. How will it be presented, the first production cabriolet motorhome in the world? How will it be picked up by the press and visitors? We'll find out in a dozen or so days. The world's first convertible camper will be presented at the CMT 2019 in Stuttgart. We invite you to stand 5A 91, next to the bistro. Below are some pictures of details.